I put off going to Yeti Cave for months before a friend talked me into trying a workout. Although I felt like I was going to die, I wanted more. Yeti Cave has changed my life! I feel great and have lost almost 30 lbs. My wife has jumped on board too. Coach Nate and all of the coaches are amazing and make it easy to come to the gym every day! You feel like part of the family as soon as you walk in the door. All of the workouts are tailored to you ability level and the coaches make sure you are moving properly as to not injure yourself. This isn't your typical CrossFit gym, it's amazing! Crossfit has always intrigued me, but I never thought I'd be able to complete the movements and workouts that I assumed the sport demanded. However, my experience at Yeti Cave has completely transformed my outlook on fitness and my own capabilities. The owner, Nate, is endlessly encouraging and knowledgeable. I have seen tremendous gains -- mind and body -- since my first day at the gym almost 6 months ago. My initial goal was to "lose weight," but I am amazed by how much more I've gotten out of this experience than just that: shredding fat, losing dress sizes, building muscle in every part of my body, and broadening my own mental capacity are more than enough reasons to keep me coming back every day, week after week. All of our wonderful coaches and members are truly a blessing and I love sharing these experiences with them! If it weren't for Nate's personality, expertise, and seriously supportive attitude, I would not enjoy crossfit and would never have given it a second chance. My doctor suggested that I pursue PT or a workout regimen to eradicate chondromalasia in my right knee and lose weight. Nate has helped where nothing else did, and I've tried numerous things over the 17yrs I've been dealing with this problem. To see fat replaced with so much muscle under Nate's watchful, supportive eye - it's a huge boost to confidence, ability, and being fit which is my goal, most likely everyone's goal. If you're out there and not having fun doing crossfit, then you're not training with Nate and should be. There are numerous crossfit gyms far closer to my house than Yeti, my kids used to constantly ask me why I don't go somewhere closer. One word, no kidding: Nate. I've been a gym member for just over, and Yeti Cave is an excellent gym. First and foremost Nate the head coach is a fantastic trainer. The atmosphere around the gym is fun and friendly. 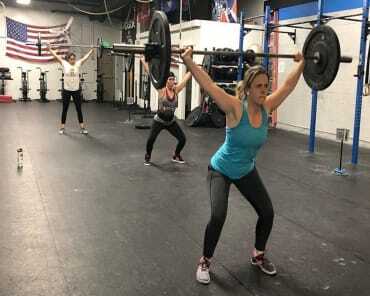 It's a great place for people of all abilities and fitness levels from experienced CrossFitters looking to push their personal limits to people like me who hadn't been to a gym in let's just call it "awhile". I love Yeti Cave CrossFit! I have never been a "gym" person and joining was scary, initially. I quickly learned that this was a place where I would not only get fit but feel welcome by all. All the coaches are knowledgeable, caring, and truly want everyone to be their best. I have never felt better, both physically and mentally, than I do now since being a member of Yeti Cave. I have lifted weights I never thought possible and have made good friends to boot - it's almost like fitness is a side benefit! I wish I would've joined long ago! I starting working out at Yeti Cave CrossFit just under a year ago. All I can say is that Nate and all the coaches at this gym have changed the way I look at fitness. The community atmosphere, great coaching, and top notch equipment have made me a member for as long as I will be in Northern Colorado. If you ever question that CrossFit is not for you I would recommend you talk with the owner Nate and sign up for a month. That is exactly what I did and I never looked back. Signing up at Yeti Cave CrossFit has been one of the best fitness decisions I have ever made. I came to CrossFit in December looking for a crazy challenge. As a middle-aged mom to a very large family, I needed something to not only get me in shape, but to inspire me to work hard, try something new and get fit again (it's been a long time!). I was intimidated and quite frankly terrified to try CrossFit--especially weights. A few weeks down the road now and I am SO thankful that I took a huge leap of faith. Nate has been such an encourager while pushing me to believe that I CAN do things that I never thought I could ever do. You truly are never too old to learn and try new things. Thanks, Nate! I am so grateful for your encouragement, your amazing knowledge, and the way you help every member as if they were the only one. I never thought I would say it, but I love CrossFit. Yeti Cave CF is an awesome gym with great coaching and great people. I've had the opportunity to do classes, open gym training and coach at Yeti Cave and the thing that makes the biggest impression on me is the genuine push you get from everyone and the fact you will laugh at least once and have a great time. So many times you'll see people hanging out for an extra hour doing mobility because they just don't want to leave. Nate is an excellent trainer. He cares that you use proper form and technique and if it's off he makes you fix it. He also cares about you as a person and is always going and supporting the members of his gym. I love the mottos of move more live more and win the week. Nate helps push you beyond your limits and I am doing things I never dreamed possible. His program is on point and works for anyone. He will always encourage you to do your best and to be a better person. There isn't another gym out there I'd like to spend my time at. I guarantee you will walk away faster stronger and better then what you came in as. I have been a member for almost one year now, and I love this gym. All the members are great people and the coaches are even better. Nobody will ever make you uncomfortable, and you are always encouraged to keep getting better. I am a cyclists above all else and have never really been into lifting to much, but this place has improved my overall cycling and life in general. It will help you become a better more well rounded person, and its fun at the same time. I haven't done crossfit in years and was hesitant to join another gym from being so far out of practice. I walked in and found Nate to be extremely approachable and welcoming. The gym has a very warm atmosphere. Nate encourages athletes of all levels of experience and goals. Whether you are looking to compete in regionals or simply get out and get moving, Yeti Cave is the place for you! 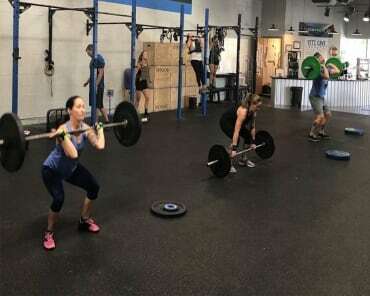 Yeti Cave CrossFit is a great choice for absolutely anyone wishing to become more fit and strong. 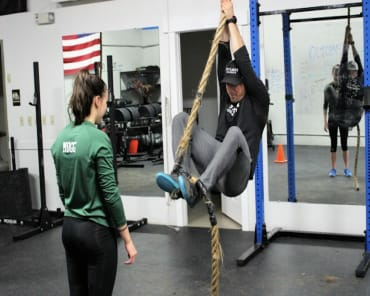 I’ve been going to CrossFit gyms for seven years and I love that their workouts can be adapted for people at nearly any level of ability with infinitely scalable options. The coaches at Yeti Cave are particularly attentive and able, helping each person to continually achieve as much as they can. As a woman in my sixties, I’m impressed that everyone, not just the ultra-fit super-athlete, is treated equally well and helped to continuously improve. I’ve been able to do things that I never imagined. Nate Seitz (the owner) and the other coaches at Yeti Cave also spend considerable time helping each one of us with body tempering techniques to conquer the tightness and soreness that always accompanies a strenuous workout regime. The gym culture at Yeti Cave has all the best of what I’ve come to expect from CrossFit. Each and every athlete is supportive and helpful to all the others. Every achievement is celebrated and members go out of their way to get to know each other. I couldn’t ask for a better place to spend my fitness time. Yeti Cave plays an important part in keeping me healthy & active. You can do this at any level of fitness because Nate is an excellent trainer/coach and tailors the workout to your level...and the progress has been quick for me! Super fun, challenging workouts (no boredom in this gym! ), great people, and brand new equipment. Love it here! I have been at the YetiCave for over 10 months now. I have watched it grow with amazing new members, and amazing coaches. Every single coach here adds a fantastic dimension to this gym! I am loving YetiCave and it's members, coaches, workouts so much that I look forward to going to the gym!! !...which keeps me a regular at least 3 days a week. Because of this, my life at 50 has dramatically changed! I'm more fit and look better now than I have in 15 years! I've now got a tough mudder, a 14er and a laundry list of other accomplishments under my belt thanks to my fitness level, which has dramatically changed in 10 months. I give all credit to the coaches who tailor the workout to my level, but also know when to push me out of my comfort zone to the next level. I love YetiCave Crossfit! The yeti cave is the highlight of my day. Nate and all the other coaches are knowledgeable and more than willing to step aside with each person that walks in to help them with any goals they might have. Whether that be moving more weight, technique, or stretching and mobility. Not only are the coaches amazing, the whole community is like a big family. Love it there! Yeti Cave Crossfit is unlike any gym I've ever been to before. Every single one of the coaches, and the people, in the gym genuinely cares about you and about each other. The coaches are amazing at getting to know each person as an individual and knowing exactly what they can and can't handle, and will adjust workouts accordingly! I promise that you will never find a friendlier or more fun gym with coaches that are more knowledgeable than at Yeti Cave. Yeti Cave Crossfit is the best gym that I have ever been to by far!!! All of the people who go to the gym and all of the coaches are so kind and supportive. Every workout it’s guaranteed that you’ll have a friend to have fun with while also being pushed and feeling completely comfortable. The people at yeti cave are beyond any I’ve ever met, the atmosphere here really attracts the best people! Not only do you gain a second family, you gain access to extremely nice and new equipment and top of the line coaching from some of the most knowledgeable people you’ll ever meet, especially Coach Nate. I would and do recommend this to anyone I come across! It is life changing in the best way. Yeti Cave Crossfit is the best in town, hands down. You can walk in with no experience working out ever and still feel so comfortable and welcome. All of the coaches are extremely knowledgeable and you can tell that they truly care about each and every person that walks through the door. Not to mention, you're always guaranteed a fantastic workout. 10/10 would recommend to a friend! Excellent coaching, great programming and amazing people! Exactly the community I have been looking for since moving to Fort Collins. Super supportive and fun! Honestly, from one gym to another, there really isn't much of a difference, at least in terms of equipment, things of that nature. Certainly, Yeti Cave has great equipment and getting new stuff all the time. Where Yeti Cave separates itself automatically begins with Nate. He understands the bugaboos of Crossfit (bad form, fast reps, etc.) and makes a point to tailor-make each workout to each individual athlete, so they can excel properly. Everyone is different and has different needs. He gets it! The other thing that truly makes Yeti Cave wonderful is the group of athletes themselves. Good humble people, whom only want to push each other to be better. No egos, no shaming, just progress! Don't miss out, come join and become a better, well-rounded person. Win the week! Coach Nate Seitz definitely knows what he's doing and is very versatile in training every level of athlete from beginner to elite. Whether it's your first time in the gym or your 100th, he'll take you to the next level, all while emphasizing proper form and injury prevention and recovery. Yeti Cave, its athletes, and especially Nate are awesome! Nate is extremely knowledgeable and passionate about sharing everything he can with you to help you grow. The athletes in this gym are so positive and supportive, and make working out incredibly fun! Nate is a great coach and an all around great guy. Gotta be able to trust your coach!! Awesome culture in here too. As a lifelong fitness enthusiast, I fancy myself in shape and knowledgeable in the ways of the weight room. How wrong I was. My introduction to CrossFit was through the smiling eyes of Coach Nate Seitz. He invited me to his home gym (the original Yeti Cave) to practice the basics and to build the coach/student dynamic. Once I had proven that I wouldn’t hurt myself or other in the gym, Nate and I would lift regularly together in the mornings, over lunch, or after work. Even on the weekends. He refined my technique with a kind and informative approach, encouraging me to always be better and to leave my ego at the door and focus on technique, repetition, and then weight. I have competed twice now in the CrossFit Opens, and continue to share the love of the CrossFit community to the students I teach in ROTC. Nate is an excellent coach and I am excited for those who will benefit from his mentorship. I have been a member for almost one year now, and I love this gym. All the members are great people and the coaches are even better. Nobody will ever make you uncomfortable, and you are always encouraged to keep getting better. I am a cyclists above all else and have never really been into lifting to much, but this place has improved my overall cycling and life in general. It will help you become a better more well-rounded person, and its fun at the same time. I came to Yeti Cave ten months ago as a middle-aged, seriously unfit mother to a large family. I had never lifted a weight in my life! I walked in the door completely intimated and terrified of trying something new. I walked out the door that first day feeling so encouraged and supported! Every member reached out to say hi and Nate was just amazing taking time to coach me. The community at this gym is awesome! Ten months later and I am doing things I never imagined I could EVER do…thanks to incredible coaches and a super supportive community.